Villages will be swallowed up? Kidlington, Gosford & Water Eaton, Yarnton and Begbroke are all under threat. Residents in Cutteslowe/ N. Oxford will be profoundly affected as will everyone who uses the Golf Course. 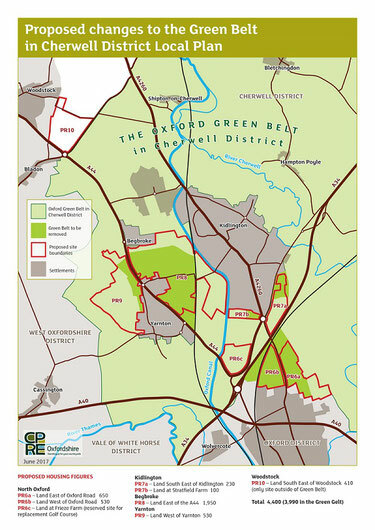 Woodstock also stands to lose out with 410 homes - the only site out side the Green Belt being selected despite long standing and bitter local opposition. These proposals are not final. We are up against developers who will continue to lobby for release of yet more sites in and around Kidlington. All feedback to this consultation will be considered by the independent Planning Inspector charged with deciding if Cherwell's plans are sound. Kidlington could grow from 6,000 to 10,400 households. Our green fields sacrificed to Oxford's greed for expansion. Traffic problems will be horrendous. Schools and health services stretched. Precious countryside walks and views lost, habitats destroyed. Kidlington's green setting is the most valuable amenity residents possess. Unless we act it may be lost forever. We are working in tandem with other action groups representing affected communities. If you want to be put in contact with your local organisers send us an email & KDW will gladly forward it on.